← Will the curse apply to Megatron? Then, I wake up from my daze. Wow. I’m a loser. The more I think about it, the more excited I’m getting for the playoffs. I can’t wait. This is the second straight season in which the Bulls have finished with the leagues best record, and they’ve done it this year without the reigning MVP for almost half the season. I could go on about how I’m worried if Rose will be able to shake off his rust come playoff time, but that would ruin my perfect moment. I’ll save that for later. I cannot say enough about the job that Tom Thibodeau has done in his tenure with the Bulls. He has this team playing every night like it’s the playoffs and has set up the blueprint for many years to come. The blueprint for Thibodeau is simple: Play defense. Thibodeau has made the Bulls the best defensive team in the league and you rarely see this team take any plays off. In addition, everybody on this team knows their role. You don’t see starters such as Joakim Noah and Carlos Boozer pouting on the sidelines when they are benched for Taj Gibson and Omer Asik late in the game. That’s not the style of this Bulls team. You didn’t see Derrick Rose pouting on the sidelines when he was benched for C.J. Watson late in the 4th quarter and overtime of a Heat game. No, that’s just not the style of this team. This is part of the reason I am so confident that a championship is on the horizon for this Bulls team. They are 12 deep. Every player on this team makes an impact. 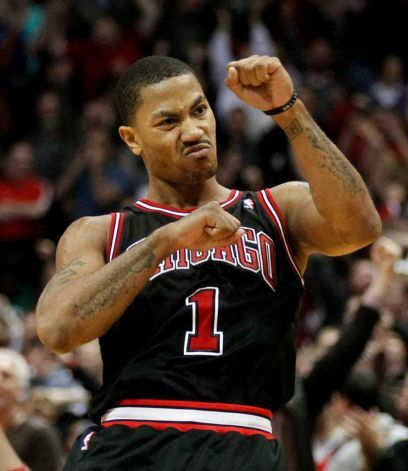 When Derrick Rose is struggling, C.J. Watson steps up. When Watson is struggling, John Lucas steps up (See March 15 vs. the Heat for that). It’s simply a joy to watch this team play. For the record, yes I realize this is a completely biased article. What do you expect from me? Is this the year that the Bulls get to hoist the Larry O’Brien trophy for the seventh time? After getting dismantled by the Heat in five games a season ago, it was clear that Derrick Rose needed some help. The Bulls turned to Richard Hamilton this off-season, who has struggled to stay on the court this season. Until that inevitable series comes against the Heat, we will not know if the Hamilton experiment was a failure or not. Oh no, I hope I didn’t just jinx it and the Bulls will lose before the Eastern Conference finals now. In addition to Hamilton, the Bulls will need to get something out of Carlos Boozer to get past Miami. It’s no secret that Boozer had a rough playoffs last year, and there is reason for optimism this time. For one, Boozer is the only Bulls starter to not miss a game this season due to injury. He’s looked more comfortable in his role with the Bulls this year. They’ll need him to outplay Chris Bosh if they want any shot at beating the Heat. While I’m trying to take the playoffs one series at a time, I cannot begin to explain how badly I want another shot at Miami. How badly I think the Bulls are the better team. Yes, the better team. The depth of these two teams is not close, it just helps that the Heat have LeBron, Wade, and Bosh. Now, you’re probably wondering (or not) if my daydream will continue into the NBA finals. You better believe it will. Not for now though, let me enjoy the glory of beating the Heat in my head. This entry was posted in NBA and tagged C.J. Watson, Carlos Boozer, Chicago Bulls, Chris Bosh, Derrick Rose, Dwyane Wade, Joakim Noah, John Lucas, Lebron James, Miami Heat, Mike Breen, NBA, Omer Asik, Richard Hamilton, San Antonio Spurs, Taj Gibson, Tom Thibodeau, Wesley Kaminsky. Bookmark the permalink.